After posting the page on my son's toothpick bridge, I heard from another father in Quebec, facing a similar task with a completely different set of rules. It brings to mind a good friend of mine, Kent Bellows' comment, who said,"I've been though aLOT of these school projects and before you do anything, get a set of written instructions!" This father in Quebec decided to use an almost honeycomb like structure. 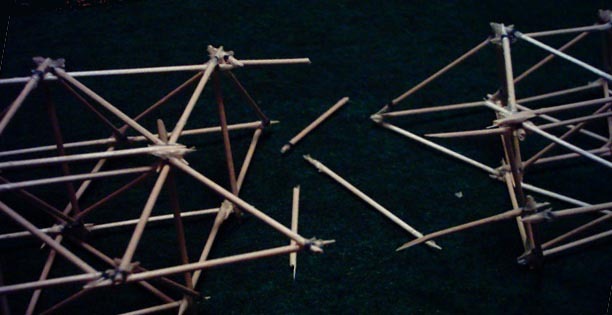 The rules in that contest required round toothpicks to be used. The span was 25cm. A sane testing approach using sand in a bucket tied to the center of the bridge will be employed when the time comes. In the meantime, I will post some pictures of their design. The design, I believe, is based on building blocks of equilateral triangles and pyramids. 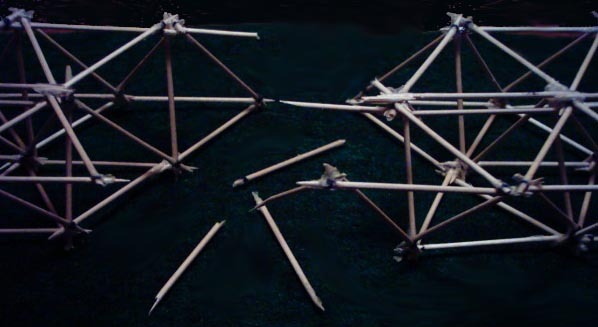 Buckminster Fuller wrote extensively about Geodesy and tensegrity, and I am sure that it is among his writings that I saw him tout these triangular shapes as some of the strongest. The triangle, the simplest area defined by straight lines. This design uses equilateral triangles in two rows on the bottom. There are 4 points, 5 points, and 4 points, on three parallel lines. through the bottom plane. Above the same scheme is one point less on each line, so a pattern of 3,4,3 results. 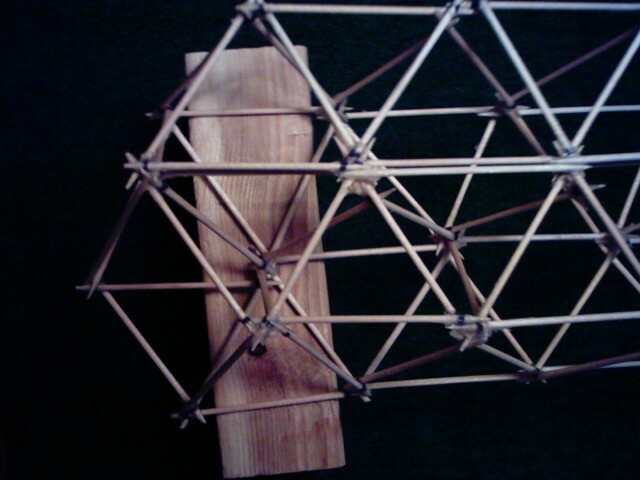 The upper is connected to the lower by equilateral pyramids of 4 sides ( three sides and a base). This deceptively simple repeating pattern mimicks nature and creates a strong grid in three dimensions. 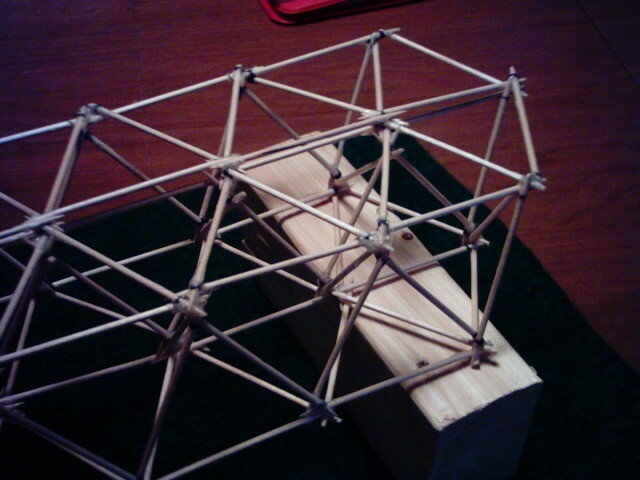 Each strut is a single, round toothpick. When finished, this span weighs less than 25g. One tip I learned from their experience is that there are better grades of white glue. It is fairly obvious that there is a great deal of stress on the glue joints in a design such as this. A board distrbutes the load, but also helps 'span' the chasm. Few toothpicks for this design. A mere 126 toothpicks make up this entire bridge. 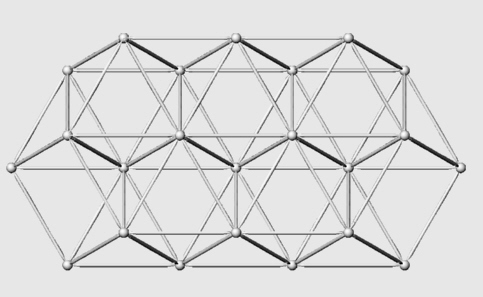 The actual toothpick bridge has 7,8, and 7 nodes on the bottom and top, instead of the 4,5, and 4 mentioned above. So far, testing has been done with a pine board distributing the load. While this might be instructive in a general way, it only stress the the bridge in a compression mode. 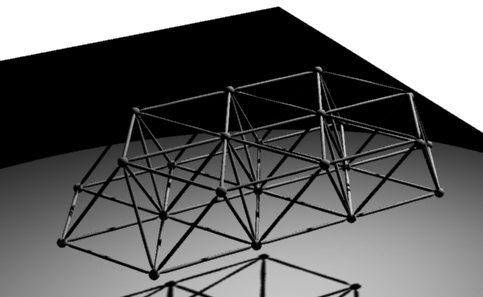 The tension resulting from spanning from both sides and using a 'point source' for the load may end up causing some surprizing results. 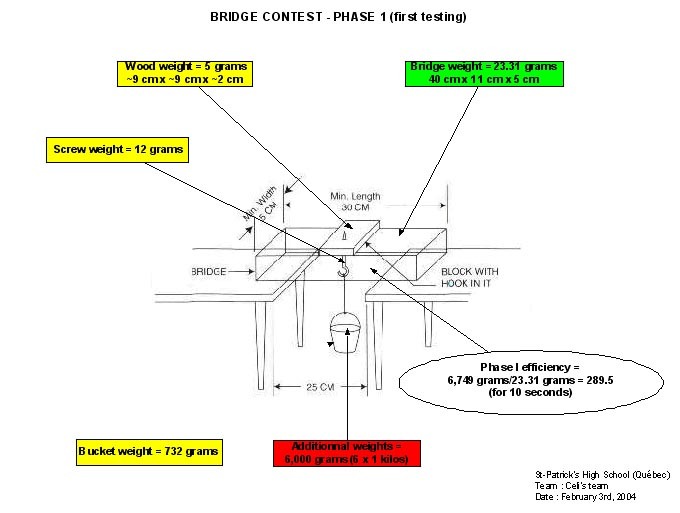 First, when the bridge, which is essencially a truss, is loaded in the middle, there will be a 'moment' associated with the load and its distance from a side. The moment is what makes a lever so effective. Think of a load in the center of the bridge as a sort of pressing on a lever. The further away from the edge, the more difficult it is for the truss to withstand the force. We shall see, below, how this bridge survives. One thing for sure, the rules seem to vary quite a bit in different versions of this classic and instructive problem. The Quebec bridge has passed the first round of testing. ( see the test setup above) At 6.75 kg, the weight was around 15 lbs. This is a significant test. ... only to be crushed. Well, the father from Quebec has sent me the last word on his project. The above picture tells it all. After surpassing the 27 lb. 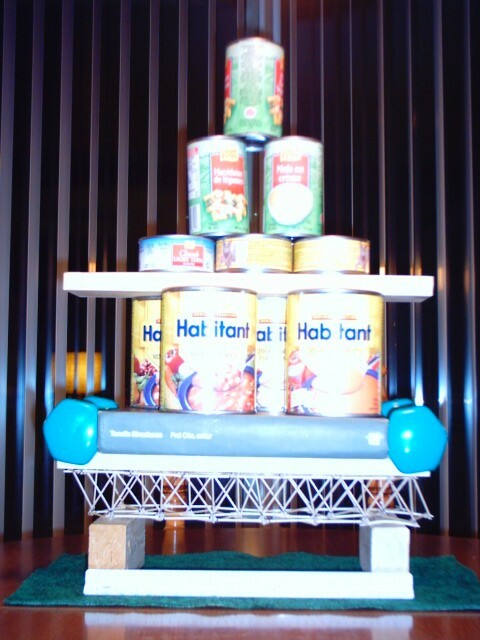 test, the tiny bridge collapsed at 35 lbs. A very respectable showing. Now for the autopsy. The narrow moment across the beam put the most stress on the bottom row in tension. There is also a tendency for the wieght to exert a rotational force, snapping the bridge, and its individual members, like a twig. From the photos, it appears the toothpicks snapped. The glue joints seem to have held!! It seems there was a particularly good brand of white glue available up in Canada. In some competitions, certain glues are disqualified. Check the rules before using any exotic glues. I would like to thank our French Canadian father-son team for this story. We can learn alot from their experience, as I am sure they have.